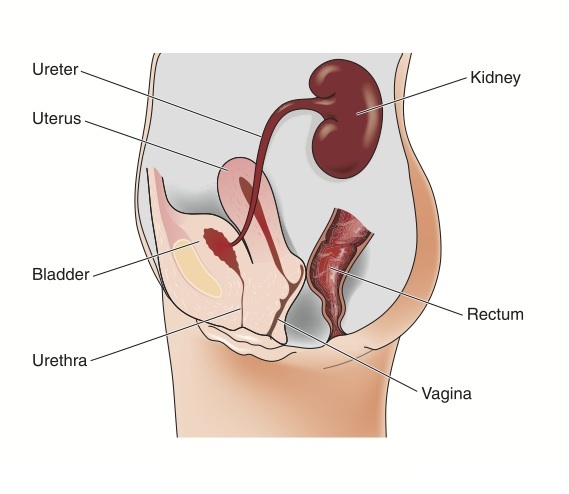 The uterus is situated on top of the bladder. As your pregnancy progresses, the weight of the uterus may place pressure on the bladder, in addition, some pregnancy hormones affect the bladder and attached organs, and this can increase the risk of bacteria ascending into the bladder and creating a urinary tract infection (UTI). The main bacteria responsible for a UTI is Escherichia Coli. An untreated UTI can get worse and develop into pyelonephritis, an infection of one or both kidneys. From the 6th to 24th week of gestation, pregnant women are more likely to have a UTI than any other time during pregnancy. However, an infection can occur at any stage of gestation. Some women experience only a small number of symptoms and other experience extreme pain and a plethora of symptoms. If you are experiencing any of the following symptoms, talk to your obstetrician about the possibility of a UTI. Urinary tract infections are simple enough to cure with proper diagnosis, but if the condition goes untreated, it can lead to a kidney infection. Kidney infections increase the risk of preterm labor and lower than average birth weight. Proper treatment of the UTI is necessary to prevent complications. UTIs are treated with a course of antibiotics. The course typically lasts between three and seven days, depending on the severity of the infection and your previous medical history. Some patients who suffer from recurring UTIs during pregnancy may be placed on a low-dose course of antibiotics to prevent re-infection. As long as the UTI is caught early, women typically recover 100-percent after taking an antibiotic. Recurring UTIs are rare, but they do happen, so your doctor may talk with you about making changes to avoid future infection or about taking a long-course antibiotic to prevent future infections during pregnancy. Some women require longer courses of antibiotics to cure the infection.